Bonjour lecteurs! In case you missed it, our house is half Frenchie. So nothing abnormal in having Frenchie food, right? It is a fact that both Frenchie Mummy and Baba love food. But today was a treat as Baba Had Ladurée Macarons. He would not be the famous Frenchie Baba if he was not doing so, after all, non? So here is our Living Arrows 7/53 with some yummy treats in it! This week has been full on and really exciting for us! We are now settled in our new house. The entire Frenchie family can operate as real humans. We have a new sofa as well as a fridge, a washing-machine (hurrah! La maman can pretend to be a perfect housewife again!) and a beautiful dinning-table! Exit the boxes that were surrounding us at the start of the week! We are officially unpacked and our house is neat and tidy. I personally hoovered the entire place ce matin so it better looks stunning. What else have we been up to this week? Well, we checked out our new neighbourhood, including some outlet shopping and Baba discovered his new nursery. Finally, Frenchie Mummy got pampered at the Mondrian Hotel. So after all those adventures, we deserved a sweet treat. 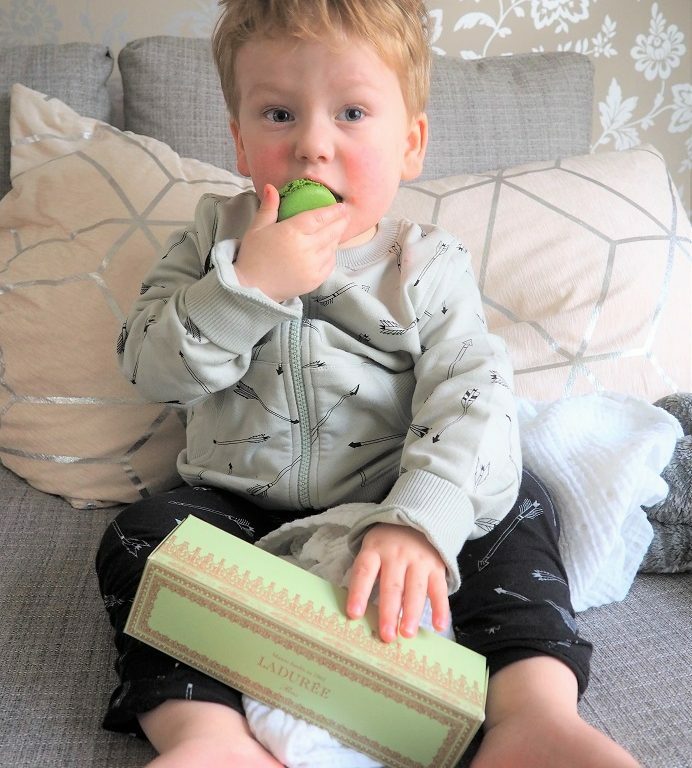 Keeping a tight grip on the box… Those macarons are going nowhere else but in his mouth! 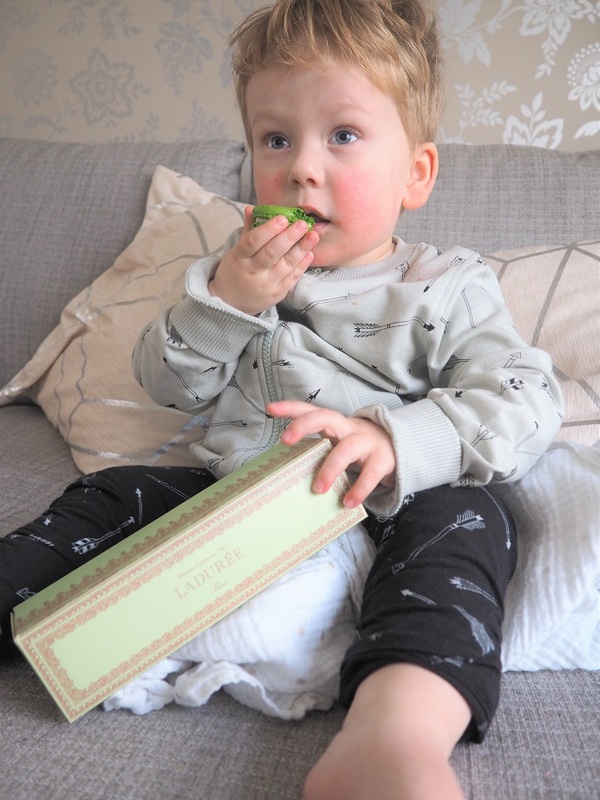 Nothing better than some Ladurée macarons with a cup of tea and Baba’s favourite cartoons. I actually had some too (Baba was not to have them all for himself, right?! Ok I will go jogging first thing in the morning tomorrow… Or maybe later on this week if it is too cold!) and it was so yummy! My favourite was caramel while Baba really enjoyed the pistachio version. Luckily, Frenchie Mummy managed to have some too. C’était délicieux and le bébé is so full and happy he is currently sleeping on the sofa while Frenchie Mummy is typing those lines! As we say in Frenchie, ‘C’est la vie!‘ Well, la vie de rêve really and who would complain about it? Pas moi! 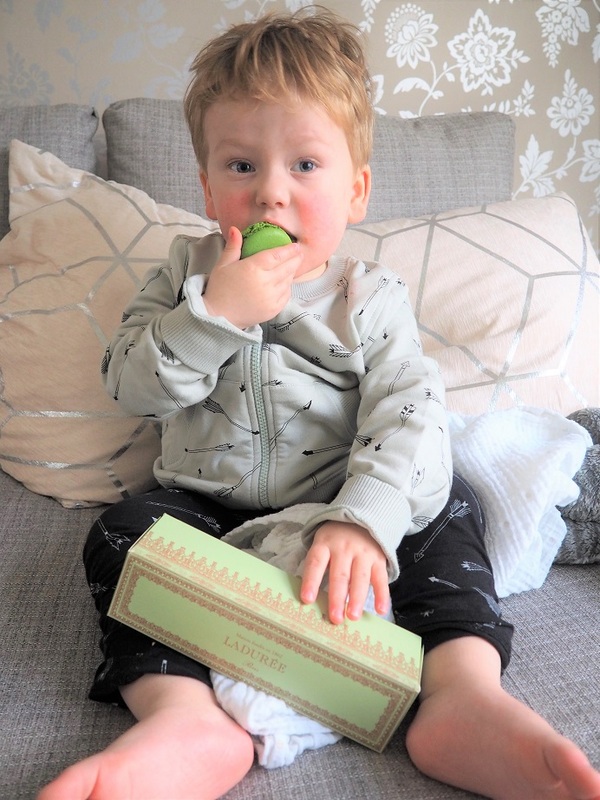 Thanks for reading Living Arrows 7/53 – Baba Had Ladurée Macarons this week. I hope you will have a fabulous half-term with the children. I know, it is hard work, but pas de panique! To make it feel better, Frenchie Mummy has some cool giveaways lined up for you to win some gorgeous prizes next week. Make sure to have a look at the blog as well as our Facebook page! Wishing you a lovely Sunday evening. Ours will be made of salad after all those gorgeous macarons! Well, maybe not! Those macarons look delicious- my favourite sweet treat! Perfect with a dark coffee on a Sunday afternoon! oh you have to try some now! Looks like he’s enjoying that lots! I’ll admit that I’m not the biggest fan of macarons – I think they have almonds right? Thanks for sharing! So glad that you are settled into your new house now. He looks like he is really enjoying those macaroons.